Where to Buy The Classic 18-3-6, The Classic 18-3-6 with 50% SRN Plus Minor - 2.5 Gallons - $82.55 for Sale with Fast Free Shipping! The Classic 18-3-6 with 50% SRN Plus Minor - 2.5 Gallons is a professional liquid fertilizer made from the highest quality N-P-K raw materials and micronutrients that contains 50% Smart Nitrogen, a proprietary slow-release nitrogen source. Turf Marker Blue Select Spray Pattern..
Smart Nitrogen's high efficiency, its labor-saving potential, and its enviable environmental profile make 18-3-6 a golf course favorite. Safe and easy to apply through traditional spray applicators or through fertigation, 18-3-6 provides golf course superintendents with a perfect balance of quick-release nitrogen for fast green-up and slow release nitrogen for continuous, steady feeding without flush growth. Its unique liquid formula provides dual efficiency from foliar and root feeding, and its chelated micronutrients are immediately available for improved turf health. 18-3-6 has an exceptionally low salt index, and contains no harmful chlorides, hydroxides, or high sulfur products. Plus, the highly complex Smart Nitrogen polymers contain carbon, which improves soils and feeds beneficial microbes. Growth Products' Classic Program For Greens recommends using 18-3-6 on a 10- to 14-day interval, along with Micrel Total or X-Xtra Iron, plus Essential Plus and Hydro-Max for a complete greens maintenance program. 18-3-6 can also be combined with other Growth Products to meet your individual requirements and your turf's unique needs. 18-3-6 liquid fertilizer is recommended for all turf grass applications, including Bentgrass, Rye, Fescue and warm season grass. 18-3-6 can be safely used on Rye overseeded areas. 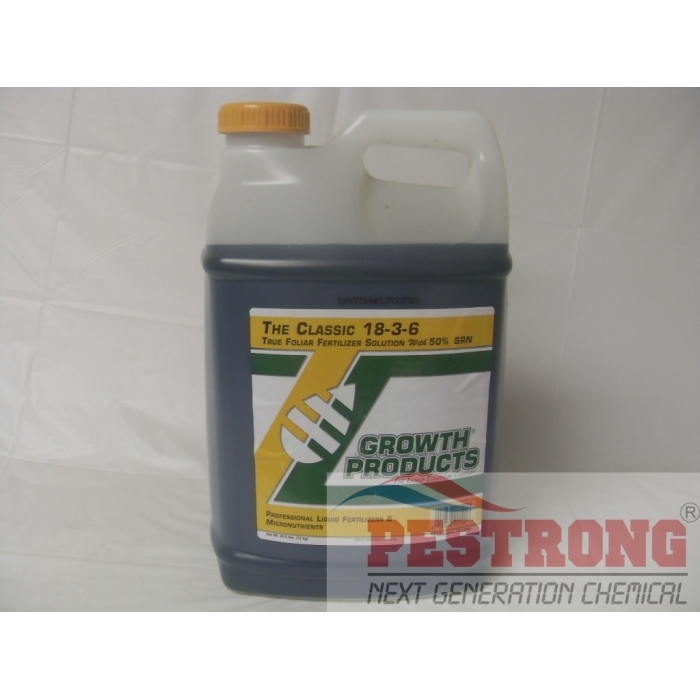 18-3-6 is ideal for both foliar spray and soil injection of trees and shrubs. 18-3-6 is compatible with herbicides, fungicides and insecticides. No special agitation is needed. Rate: 7 - 20 oz per 1,000 sq.ft. see product label for details. Essential for strong growth and development. Has worked well for me for years now. Good deal on price.